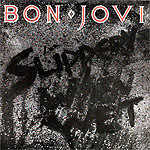 CD review: "Slippery When Wet"
This album really stinks, although a couple of songs redeem it slightly. Yes, it's their best-selling record yet (as of 1986). But "Slippery When Wet" is a sell-out: schlocky, MOR Top-40 trying to pass itself off as metal or hard rock. It seems as if the band has memorized a formula, and just plugged in slightly different sounds each song. The highlights of the album are "You Give Love a Bad Name" and "Raise Your Hands." On these two songs, the band seems to wake up for awhile and regain that raw, hungry edge that made Bon Jovi's first album so damn fine. On the rest of the album, the band seems bored, like they have nothing more to prove. "Livin' On a Prayer" sounds like a reject from one of John Mellencamp's albums; hardly the way to keep a hard-rocking reputation. Jon Bon Jovi's voice just can't cut the ballads, but they keep trying to pull it off. I don't know, maybe they figure the radio stations will play the ballads and they'll sell more albums.